Summary: This snappy, sassy redemption story set in small-town Montana is “a wild and crazy debut novel by a talented young writer” (Jackie Collins), filled with an uproarious and unforgettable cast of characters you won’t want to leave behind. I've been in quite the reading slump over the holidays. I am way behind in reading and therefore writing reviews; however, one book I managed to read and really enjoy was THE FLOOD GIRLS by Richard Fifield. I wasn't quite sure that to expect from the book's description, but I admit I was willing to give it a try based on the blurbs, reviews, and accolades that this novel has received. I am happy to say that I wasn't disappointed. THE FLOOD GIRLS had a little bit of everything... and it was both heartwarming and funny! THE FLOOD GIRLS tells the story of the quirky residents of Quinn, Montana, and one zany women's softball team. Rachel Flood returns home after almost a decade. She has worked the AA program and has reached the step of making amends to those she hurt. It's obvious right away that Rachel left some damage in her wake when she left Quinn, namely the relationship with her mother. Rachel doesn't want to spend much time in Quinn, but she feels like she needs to set some things straight before she can move on with her clean and sober life. Rachel's mother, Laverna, is a piece of work. She owns the local bar named The Dirty Shame and definitely isn't familiar with the term customer service. The bar tends to the locals including a lot of firemen named Jim and a group of lesbian miners. And get this... Laverna doesn't serve mixed drinks because they are too much work -- it's a beer only kind of place. When Laverna is injured in a crazy accident, Rachel decides the best way she can make amends is help her run the bar. It just about kills her to deal with an unforgiving and bitter Laverna, and things become even worse when Laverna forces her to join Quinn's women's softball team made up of a band of unforgettable misfits. Rachel is trying to reconcile her past with her future and, in the process, she experiences a wide range of emotions. Thank goodness Rachel has managed to make a few friends in town including a fashionista preteen boy named Jake. With Jake's help, Rachel discovers many things about herself while also discovering what it means to be part of something bigger than herself. I found THE FLOOD GIRLS to be absolutely delightful. The book had one of the quirkiest cast of characters that I can remember in recent memory, and the story was pretty unique too. (I mean that in the best possible way!) Even though I knew from the start that the book was dealing with a recovering alcoholic who was trying to make amends with a mother she obviously wronged (although you could argue that the turmoil in their relationship was definitely two-sided), I found the first few scenes in the book to be hilarious. The author has a way with both storytelling and prose, and there were many laugh out loud moments. Needless to say, this is one book that I could definitely see as a movie! However, THE FLOOD GIRLS was also pretty heartbreaking which was not what I was expecting. Rachel was deeply troubled; and as her story was gradually revealed, it became more and more apparent just how messed up she was. And poor Jake's situation with an abusive stepfather just broke my heart. And I don't want to give any spoilers away, but there is something that occurs at the end of the novel that took my breath away... not in a good way! What I loved so much about this book is that the mix of humor and poignancy were so well done. I experienced a wide range of emotions while reading this novel and it was a fantastic ride! 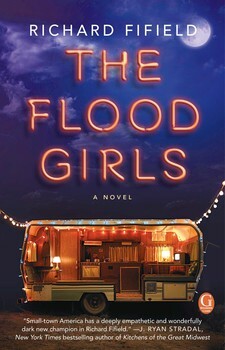 I know THE FLOOD GIRLS would make an outstanding book club selection! Seriously, this one is terrific because of the complexity of the characters. There is a reading guide with twelve questions as well as some ideas for enhancing your book club meeting like watching A League of Their Own prior to discussing the novel. Some of the themes you might want to discuss include alcoholism, forgiveness, friendship, religion/spirituality, and mother/daughter relationships. Of course, the characters are worthy of a great deal of discussion as is the setting itself. Overall, I can't rave enough about THE FLOOD GIRLS. It's a terrific story about redemption that will entertain readers and also touch their hearts. Personally, I'm hoping to see this quirky town and its residents again in a sequel...hint, hint, Mr. Fifield. Wow, it sounds like this book is outstanding!